Headlines: Despite the howling gale on Saturday there weresome nice fish caught by those that persisted. 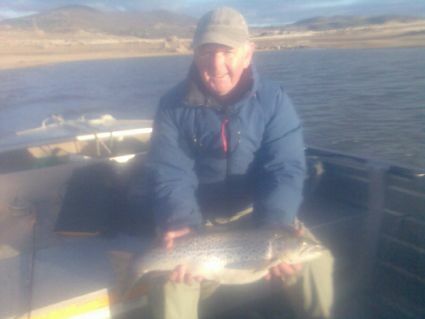 The main lakes continue to produce some excellent bank fishing, with Eucumbene rising nearly 2% in a week and the fishing has definitely picked up off the bank here with the rise. Access is now much better with hard banks to fish off. With the continued snow melt Eucumbene should continue to rise well into Spring. Water flows for the streams on the opening weekend are looking perfect at this stage also. There are lots of rainbows in the Eucumbene and Thredbo. Lake Eucumbene:- The fishing has improved in Eucumbene with several reports of fish cruising the shallows in the early mornings. These should respond well to a small streamer like a Tom Jones or Olive Matuka. The Seven Gates area has started to produce a few for bank anglers and late afternoon spent searching with streamers and small wets is a very good option. Nightime fishing will improve with the warmer weather we are experienceing this week. A few early Midge pupa will be hatching and the fish will be onto these. 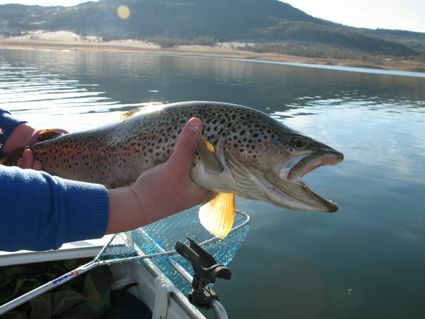 Lake Jindabyne:- The fishing in Jindabyne continues to produce some really good browns and excellent polaroiding. While not every fish that you see will be hooked on a good day you will get plenty of shots at cruising fish. The Eastern shore early in the day and the Western shore in the early to late afternoon are the best options. If you have a boat that will give you more shoreline access. Don't despair if you are only on foot, as with a little persistence, you can still find fish. Russell Rose and I spent a couple of days at Jindabyne during the past week.We didn't have any luck with the polaroiding as the rising water level seemed to have pushed the fish beyond our viewing range... younger eyes may have seen them. 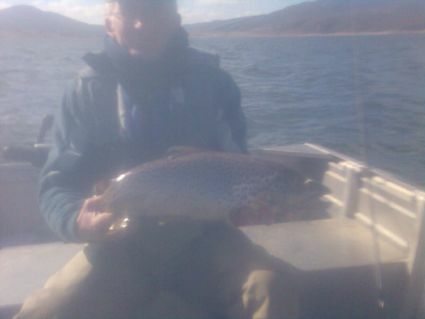 However we had good action at times, loch styling(drifting)from the boat.We managed 10 browns ranging from 55 to 62 cm.As you can see from the photos(sorry about the poor quality) the fish were in great condition.Also picked up some rainbows and 2 pretty little 30 cm brookies.The couple of browns we kept were full of small green yabbies with the odd crucian carp as well.Small black woolly buggers with a little bit of lureflash in the tail seemed to do the trick.As often happens,as the wind picked up, so did the catch rate. Photo's may not be the best quality but the fish quality is great. *Kieran O'Shannassy has been at it again with the these two great browns polaroided in the lake. He only saw the two and did well to get both. Really pretty fish. Photo's below. Have not received any night time reports but there will be some nice browns to be had in some of the bays on the Western side of the lake after dark. Think big Muddler Minnows, Sunset flies and Fuzzy Wuzzys. Best areas to look at are Sids Bay, Hatchery Bay, Creel Bay, Kangaroo Bay, and Kalkite. 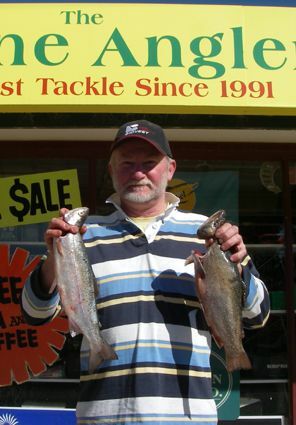 Eucumbene:- Most anglers are catching some fish but not always in big numbers. Big Rainbows are the main target at present both getting deep and on flatlines depending on the conditions. Working deeper open water will find some quality fish. Browns will start to make an appearance as they look for food after spawning. Deep diving minnows will get down to fish when trolling in close and this is where you should find the Browns. 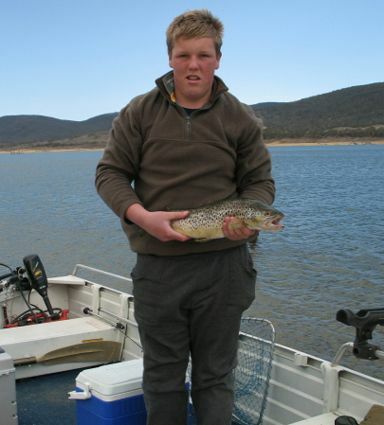 Jindabyne:- Not many reports have come in from Jindabyne over the last week. The trolling will continue to be good, with the Eastern shoreline having been the most consistent over the past two weeks. Spinning from the shore or boat with plastics and minnows has been deadly on the fish as well. 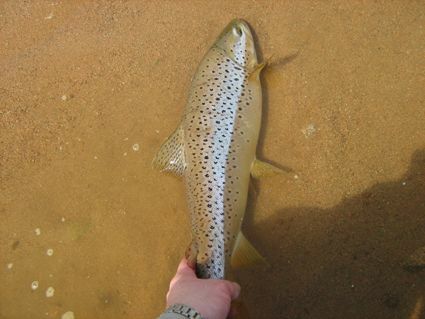 *Reports of two very good browns came in from Jindabyne this week at 3.2 and 4.5kg they were crackers. The Anglers were from Albury and were using larger 13cm Rapalas. They found that the best method was to give the lure plenty of action by holding the rod in the hand and ripping it forward, then letting the rod drop back, leaving the lure motionless, before ripping it again. Great quality fish! *Tom and Joel Penders from Canberra had a very succesful one hour trolling session late last week at Kalkite. 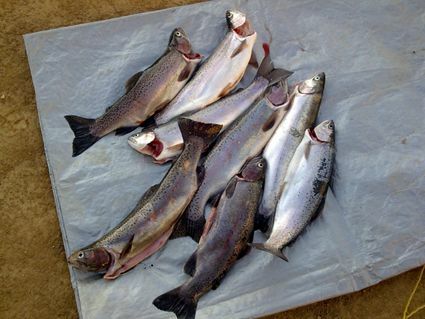 They caught two rainbows of 42 and 58cms as well as two browns of 45 and 55cm. Rapalas in brook trout, frog Flatfish, and coachdog flatfish were the best lures. Couple of photo's below. Fished Jindy Friday afternoon into the night before the wind once again sent Colin and I packing,fishing was good to about midnight,catching some well conditioned rainbows on once again on chucky cheese powerbait. 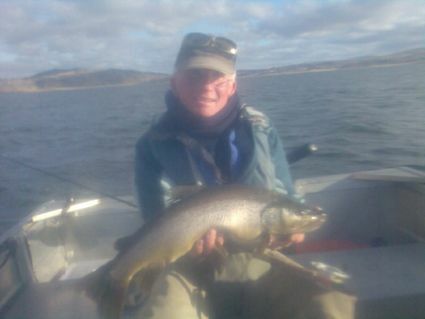 *Bill Bemrose from Cooma had a fish at Kalkite on the weekend and got these two nice fish on Powerbait. The one good rainbow and a brook trout (on right) which was a welcome suprise. *Paul and Connor from Canberra persisted in the wind at Seven Gates on Saturday and Sunday. They hooked a total of twelve fish landing seven. Six were Rainbows and one Brown. Lime twist and Orange Nugget Powerbait were the pick of the baits. They reported seeing a few rising and one big fish cruising in close.